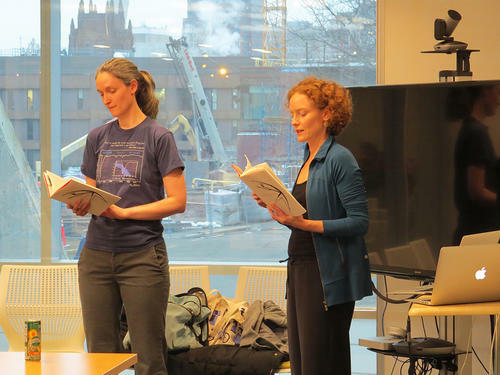 Home > News > Wright Lab hosts book launch for "Physics and Dance"
On February 7, 2019, Wright Lab hosted a book launch for “Physics and Dance,” the newly published work by Wright Lab professor Sarah Demers and Artist-in-Residence Emily Coates. 65 people from across campus attended the event, which included several readings from the book by both Coates and Demers, a wine and cheese reception, a tour of the lab, and book signings by the authors. View the Flickr photo gallery of the event.